This import double CD contains 24 great Free Radio Tunes and Songs including The Horse - Cliff Nobles & Co, Because They're Young - Duane Eddy, Man of Action - Les Reed Orchestra, We Love The Pirate Stations - Roaring Sixties, Caroline - The Fortunes, Asia Minor - Kokomo, his Piano and Orchestra, The Kid - Andre Brasseur, Slaughter on 10th Avenue - The Ventures, Rocking Goose - Johnny & The Hurricanes, Scarlet O'Hara - Jet Harris & Tony Meehan, Lover - Buddy Merrill, Little Black Samba - Norman Petty Trio, Rinky Dink - Johnny Howard Band, Guitar Boogie - Rene & His Alligators, Good Morning - David Carroll, Let's Get Away From It All - Ray Ellis, Heather - Johnny Pearson Orch, 24 00 24 - Hal Dorado, James Bond - Jaques Perry, Will Wil Wel - Harry's Orchestra, Veronica, Biscaya - A Close Call, Veronica TV Tune, What Kind Of Dance Is This - Veronica Unlimited. 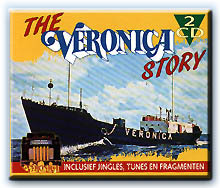 Disc 2 contains 85 Veronica Jingles in Superb Studio Quality. Also included is a 12 page colour booklet. This import double CD represents great value and a chance to obtain some sought after tracks.